I strongly recommend that you get a tuner that has both "Standard Tuning" or "EADGBE" mode, and also "All Notes" or "Chromatic" mode. Set it to "Standard Tuning" mode for now. "All Notes" mode will come in handy when you start using a capo. Tuning App: If you have a smartphone, get GuitarToolkit. By far the most accurate tuning app I've tested, and you can tap the "Mode" button (right under the tuner's needle) to switch between "Standard" and "All Notes" mode. Dedicated Tuner: The Snark is accurate and popular. Like the Kyser capo, you can stow it on your headstock, and since it works by sensing vibrations in the wood, you can use it in noisy environments. Its main drawback is that it only has a "All Notes" mode, which makes it less beginner-friendly. No matter how good a cook you are, if you use wilted lettuce and rotten tomatoes, your salad won’t be good for anything but compost, right? Well, if your guitar’s out of tune, you get the picture. You should tune whenever you pick up your guitar. It’ll almost always be a little out of tune because of changes in temperature, and all that picking or strumming you did the last time you played. Now I know tuning can be a hassle until you get good at it. My advice is to use a good tuning app on your smartphone, or a dedicated electric tuner if you don’t have a smartphone, and then just make a habit of tuning whenever you pick up your guitar. Slowly you’ll get better at it so that eventually tuning will just be a little speedbump before you start your playing. In this lesson, I’ll just show you how to tune using an electric tuner. Once you get more comfortable with playing the guitar, you should also learn how to tune by ear. It doesn’t work as well, but it’s good in a pinch. Tuning’s a lot easier if you understand a little physics. So here we go: A fun little physics lesson. Let’s start with a brain teaser: Mosquitoes and hummingbirds both flap their wings faster than we can see, right? Can you tell which one flaps faster? You can, actually, just by listening. Sound is made by vibrations traveling through air, and the speed of those vibrations, which we call their frequency, determines how high or low the sound is. Slow vibrations sound low, and fast vibrations sound high. So the mosquito’s the faster flapper of the two, because it’s making a higher sound--they flap about 500 times a second, and hummingbirds are more like 50 times a second. It kind of makes sense that mosquito would be faster, right--its wings are smaller, so there’s less mass to haul back and forth, and also less air resistance. So small things tend to vibrate faster than big things. That’s why your first string is the highest sounding string on the guitar. It has the least mass, so it can vibrate faster than the other strings, all other things being equal. There are two other factors that determine how fast strings vibrate. One is how long they are. You can see that in the way harps are designed--the highest sounding strings are the short ones, the lowest ones are the longest ones. Here’s a harp being played starting here and ending here. And when you fret a note on your guitar, you’re really just shortening the part of the string that vibrates. That’s why notes sound higher the farther you fret up the neck. And the last factor that controls how fast a string vibrates is how much tension it’s under. Loose things vibrate slower, tight things vibrate faster. And so when you tune your guitar, you’re going to be tightening the strings to make the pitch go up, loosening to make the pitch go down. My beginners always ask me which way they should turn to tighten or loosen the strings. Well, it depends on how your guitar’s been strung, and it’s hard to describe twisting direction over video anyway, so it’s best to just learn how to feel and listen. Watch me do this first, then you try it. Start by getting ready to pick your first string. If you’re comfortable using a pick, go for it, otherwise place the fingers of your picking hand below the strings on the body of the guitar, and then rest your thumb on the first string. Now grab the tuner that’s attached to the first string with your fretting hand. Start picking the string, and at the same time, turn the tuner a half-turn or so. Listen to any difference in pitch, and also feel how hard it was to turn the tuner. [loosen string] This feels pretty easy, and I hear the pitch going down. So what happened--did I tighten or loosen the string? I loosened it, because the pitch went down. Now go the opposite direction a half-turn. It’s harder to turn the tuner in this direction, and I hear the pitch going up. So I’m tightening the string. Tuning with an electric tuner is easier than tuning by ear, and unless you’re an experienced musician, you’ll also get better results. Most electric tuners look something like this one. They have a meter that shows you whether your note’s too flat, which means the pitch is too low, or too sharp, which means it’s too high, or, when your needle’s straight up and down, you have it just right, Goldilocks. The symbol for flat looks like a lower-case b, and the symbol for sharp is a number sign. You can remember them this way--if you turn a flat symbol sideways, it looks like a flat tire. A car with a flat tire is heading down. And a sharp symbol looks like a ninja throwing star, which can fly high. Haaaayah! They detect your string’s pitch with a microphone, so background noise can confuse them--background noise like me jabbering on in your computer speakers, so you might want to pause the video while you’re tuning. Before you start cranking your tuning machines, it’s prudent to confirm that you and your tuner agree on what note you’re tuning the string to. Let’s start with the 6th string. This string should be tuned to E. Put your tuner near your guitar, on your knee or your desk or music stand. Pick the string, not too hard, not too soft, and you should see somewhere on your tuner that it’s hearing an E note. It might say 6E--the six refers to the 6th string--or E2, which means, out of the ten or so E’s that we musicians have at our disposal, this is the third-lowest sounding one, E0 being the lowest. The important thing here is that your tuner says E.
If it doesn’t, that means that your string’s so far out of tune that your tuner thinks you’re trying to tune to a different note. If you have the skills, try tuning by ear to the E I’m playing here. If you’re like, “Rob, if I could do that, I wouldn’t be taking this course,” fair enough. Skip ahead to the troubleshooting section and I’ll get you on track. If you turn too fast, you’ll keep overshooting the correct pitch. The tuner needs a constant, loud sound from the string to hear the pitch properly. The virtual needle on your tuner is going to wiggle a bit, even if your string is in tune. So take an average of what you see. 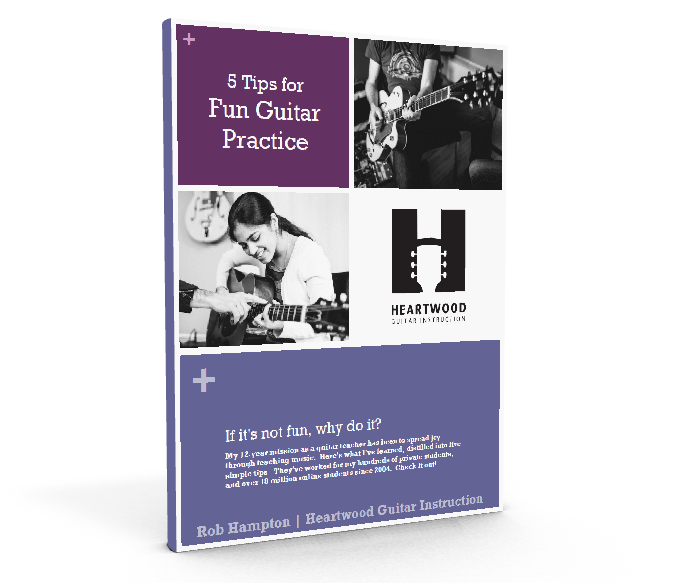 This means that you should always start with a flat pitch, meaning too low, and then work your way up, tightening the string, until you arrive at the correct pitch. If your string is too sharp, meaning to high sounding, the first thing you should do is make it flat. Why do you do this? If you tune down to the correct pitch, the gear in the tuning machine will have a bit of play in it, and when you start playing, it may slip a bit, making your string go flat. So to lock things in place, always tune from the flat side, the left side, of your tuner. If you overshoot, bring it flat again and try again. OK, here’s a chart listing each string and what note they should be tuned to. Pause now and tune each of your strings, remembering to first confirm that you’re tuning to the correct note, turn the tuner slowly, pick loudly once per second, don’t expect perfection, and always tune up to the correct pitch. I hope that went OK. Compare the sound of my strings to yours now to see if you got things right. [play each string]. My tuner’s trying to tune to the wrong note. First of all, find out if your tuner has a function where it just tunes to the six notes your guitar strings should be tuned to. This is kind of a training wheels function that may get rid of your problem. For example, in GuitarToolkit, there’s a “Mode” button that toggles between tuning to “All Notes” and the standard “EADGBE” guitar tuning. The “All Notes” mode may also be called “Chromatic” mode. When you’re in the mode specific to tuning a guitar, even if your string is off by a note or two, the tuner will still help you tune to the nearest correct note. Now if your string’s miserably out of tune, it’s totally lost in the woods, this “guitar mode” won’t help things. In this case--or if your tuner will only tune in the All-Notes, Chromatic mode, you’ll need to learn a bit of music theory to help your string find its way out of the woods and back to its correct pitch. The path you’ll take is the musical alphabet. The notes that make up music in Western cultures have twelve different names. Seven of them are just the first seven letters of the alphabet: A, B, C, D, E, F, and G. These are called the natural notes. In between many of those letters, however, are notes called accidentals that have two different names--a sharp name and a flat name. Here’s how it works. We start with the letter “A”. After that is an accidental, called either A sharp--remember, sharp means higher in pitch, right, and this note is a little higher than A--OR, it can be called B flat, which means a little lower than B, which is the upcoming note in the musical alphabet. So next is B. After that we go straight to C. Then our next accidental: C sharp--a little higher than C, right? or D flat. Then D, then D# or Eb, then E, then straight F, then F# or Gb, then G, then G# or...wait a minute, we’ve come to the end of the musical alphabet. Have we run out of notes? No we have not. What we do is just jump back to the beginning and reuse the same note names we just used for all these lower-pitched notes. So the last note in the musical alphabet is G# or Ab, because the next note coming up is...A. And we start all over again. The musical snake is swallowing its own tail. So, what were we talking about? Oh yeah, what do you do if your string is hopelessly out of tune. Well, let’s say you’re trying to tune your 6th string to E, and the tuner says you’re tuning to F? Hmm...F is just one note higher than E. So in this case, your note isn’t too lost in the woods--the trailhead is just around the corner. All you need to do is to lower the pitch of your string until you’re closer to E than to F. Then tune as normal. Let’s say the tuner says your 6th string’s a C#/Db. In this case, it’s probably a little too low. Raise the pitch, and watch the tuner cycle through C#/Db, D, D#/Eb, and finally E. Once you’re in the ballpark, tune as normal. Let’s say your 6th string is registering as a A on your tuner. As you string gets more and more out of tune, it might be hard to tell whether it’s too high or too low. Your string could be really low, all the way down to an A, or really high, all the way up to the A 12 notes higher than the lower A. In this case, use your ears. Use the button tuner below to compare your string to mine. My tuner’s not even responding when I play a note. Assuming your tuner is on and has fresh batteries, you may have it in the wrong mode. For example, this kind of tuner (show Boss bass tuner) has both a guitar and bass mode. If you’re in bass mode, your tuner might ignore your higher-pitched guitar notes. Also, if you’re using a tuner just designed to tune guitars, and your 6th string is super-flat, your tuner may also ignore your note. Tune up a bit and you should get back in good graces with your picky tuner. This tends to happen on chromatic tuners when your string’s tuned exactly halfway between two notes. For example, if your first string is sharp, so that it’s halfway between E (which is what it should be tuned to) and F, which is the next note higher in the musical alphabet, your tuner’s going to hear the note and say, that’s a really sharp E! Or a really flat F. Or a really sharp E. Wait, no, it’s a really flat F. E! F! E! F! And it looks something like this. Either way, you know from my enlightening explanation of the musical alphabet that you’re sharp. Tune down a bit and all will become clear.